So I've actually had this polish for quite a while, but never got to use it! I've been buying from Pretty and Polished for a while now though. She makes some of my favorite indie polishes. 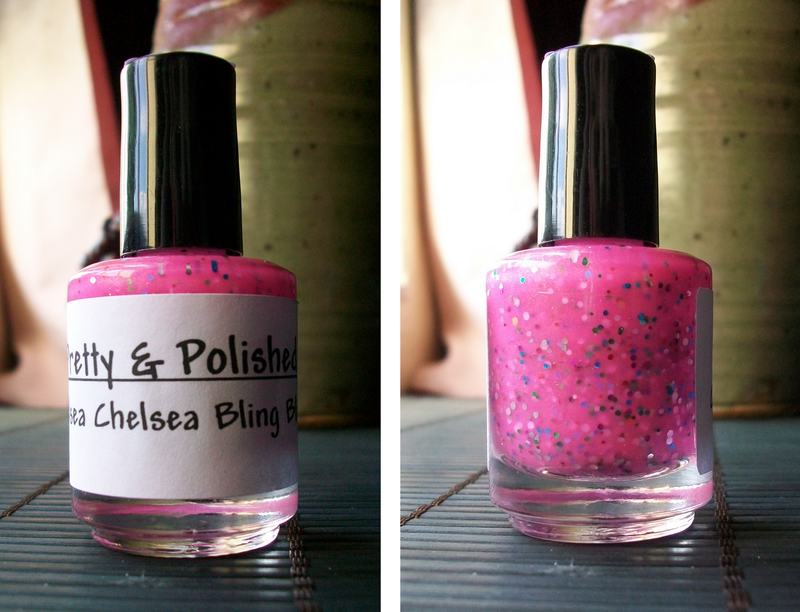 Her Etsy shop can be found here, and the actual Chelsea Chelsea Bling Bling is here. As you can see, CCBB is a pretty pink color with lots of glitter. It's a beautiful shade, not being too pale or too bright. It's a somewhat sheer jelly, so this is two coats topped with one coat of Seche Vite. I figured this still looked cheerful and springy, and would be a nice transition from my Easter mani! I was a little surprised when I first applied it. There is a very slight goldish shimmer to the polish. My camera couldn't even pick it up! I had studied the bottle after I received it, and it really doesn't show through the glass. But on your fingertips, it looks wonderful. It's subtle, but it gives it a little something extra than just being a flat pink. All in all, I think it's a beautiful polish! I absolutely fell in love with this one when I saw it in her Etsy shop, and it really meets the hype in person. I suppose it could also be considered a toned down version of Claire's Candy Shop, or Deborah Lippmann's Candy Shop. Those are a bit lighter shade of pink, and pack more glitter. A wonderful comparison of those two was done by Colour is Magic. While I own neither of those, I'm happy with this shade of pink and the amount of glitter in this one instead. All in all, I'd say this is a wonderful polish. The quality of the polish is great, it only took two coats to get the look I wanted, and Pretty and Polished also makes "three-free" polishes! for some reason this polish made me hungry, haha. maybe because it looks like candy!